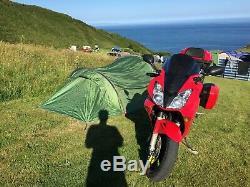 Honda VFR800 V-TEC 2003, 39 000 miles. 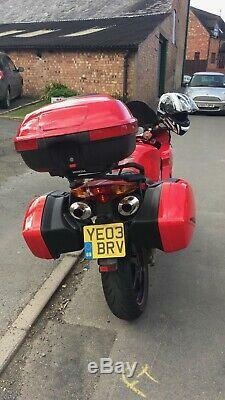 Comes with full set of luggage: top box and two panniers (colour coded). The bike has had both cam chain tensioners replaced recently, as well as the alternator and the rectifier. Fully serviced last year brake fluid all over, engine oil, oil filter etc. Tyres changed 2 years ago, still plenty of tread and good condition. I have used this for a fair few road trips around the UK, as well as my daily commuter. The paintwork is in an OK condition - there are a few scratches here and there, but no cracks. This is not a showroom bike, it has been used as my daily commuter, rain or sun. The clutch basket rattles when the bike is hot, which I have been told not to worry about, but want to provide an honest description. The battery is quite old now as well but I keep it on a battery optimiser over winter. It has a Remus exhaust fitted. MOT'd till June 2019. The item "Honda VFR800 VTEC 2003 full luggage set (top box + panniers)" is in sale since Thursday, April 11, 2019. 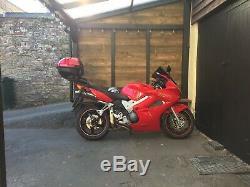 This item is in the category "Cars, Motorcycles & Vehicles\Motorcycles & Scooters\Honda". The seller is "bundziur" and is located in Leamington Spa. This item can be shipped to United Kingdom, United States, Australia.